In the latest example of a natural cataclysm displacing tens of thousands of people, and as reported earlier this week, the number of people taking shelter in makeshift evacuation centers on the Indonesian island of Bali has surged to around 104,000, officials said on Thursday, as residents fled the area around a rumbling, active volcano that is expected to erupt momentarily. Mount Agung, the largest volcano on the island, located some 50 miles from the tourist hub of Kuta, has been shaking since August, and its tremors have increased in both intensity and strength, prompting the Balinese government to evacuate prisoners from local jails and evacuated tourists and residents away from the base of the volcano. The island’s government has declared a state of emergency, according to Reuters. Thousands more people have been forced to flee in recent day as the government set up an exclusion zone around the volcano’s perimeter. 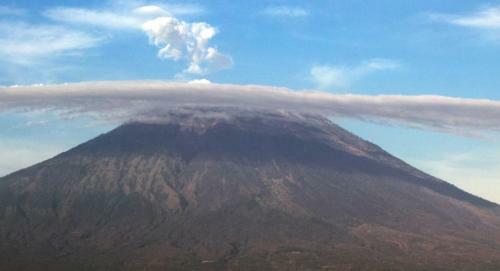 According to experts who spoke with the Guardian, an eruption is imminent. Last week Indonesian authorities announced the highest possible alert warning, and besides the evacuations they’ve also set up an exclusion zone that stretches 12km from the crater in some places. Scott Bryan, an associate professor from the Queensland University of Technology, says there have been “very good indications” that an eruption is imminent. As white smoke started rising from the mountain earlier this week, the Balinese government raised Mount Agung’s alert status to the highest level last week. The last time the mountain erupted, in 1963, a thousand people were killed, hundreds were injured and thousands more villagers had to abandon their homes. With the volcano deemed too dangerous for humans, the government is housing evacuees in tents, school gyms, and government buildings in neighboring villages. Reuters reports that, while there are plentiful stocks of food, water, medicines, and other supplies, evacuees are worried that the eruption could leave them permanently displaced. One farmer worried the lava flows could destroy his house, leaving him destitute. “If my house is destroyed I don’t know how to restart my life. I don’t know where my kids will sleep and all I can do now is pray,” said Gusti Gege Astana, 40. Officials said there are also 30,000 cattle within the danger zone around the volcano, and efforts are being made to move the livestock so as not to leave farmers financially ruined. An elderly woman who was alive during the 1963 eruption told Reuters that the evacuation instructions came earlier this time. “Back then we weren’t evacuated until it got really dangerous. Life went on as normal when ash and gravel was falling on us, until the big lava came out and destroyed everything,” said 82-year-old Gusti Ayu Wati. Indonesia has nearly 130 active volcanoes, more than any other country. Many of these show high levels of activity but it can be weeks or even months before an eruption occurs. Meanwhile, the country’s tourism agency issued a letter reassuring travelers that the island remains safe to visit, and that flights are operating normally. The letter was issued following reports that some tourists were reconsidering visiting the island. “The island is safe except for areas around Mount Agung. We urge tourists to continue visiting,” the letter said. About 1.2 million Australians visit Indonesia each year, and tens of thousands are expected to flock to Bali in the next few weeks as most states break for school holidays, the Guardian noted. In 2015 thousands of Australian vacationers were stranded as the eruption of Mount Raung, another Balinese volcano, erupted.